I had such a lovely Sunday morning at the farmer’s market. it was Sunday morning, and the market was buzzing with people trying to get a week’s worth of vegetables and fruits from the farmers themselves. A thought came to my head – that till the 1950s all food was organic only. Inorganic farming only began in 1950s and 60s, and has now completely taken over. 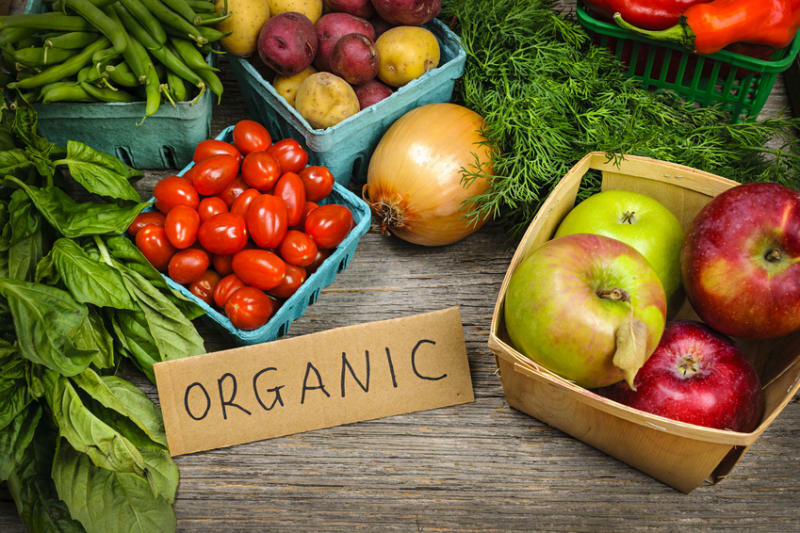 The way I look at it, organic food should be called just ‘food’ and, inorganic food should be labelled ‘inorganic food’, because that came in later. Also from the perspective of the body, our body is organic. It only understands and accepts what is organic. Anything inorganic – is regarded as a toxin, has no use in the body, and is in fact potentially harmful if it remains in the system. Various studies show the relation between increased intake of pesticides and cancer, reproductive dysfunction, autism, asthma and Alzheimer. Both of these are issues we can take up as a community and work to rectify with the Govt. agencies. But even if this remains so, we can look at eating organic as an investment, and pay the farmer now, instead of paying doctors later. Its also an investment towards a better, cleaner environment for ourselves and our future generations. A superb cost saving tip would be – go for as much seasonal produce as possible, as it will be the cheapest in season, and the most nutritiously satisfying as well ! The other contention that organic is not easily available is also nothing that we cannot work around. Organic grain, cereal, pulses and spices are easily available off the shelf so those should not be an issue. For the rest, the transition could be done in phases. One could go for fruits and vegetables from markets as and when they are available, or look for good suppliers who do weekly doorstep deliveries. When these feel light, one can more to looking for organic household items, toiletries, cosmetics, clothing, and so on.. Even if you can’t source 100%, do as much as you can. And that is good enough too! Another big contention against organic, that one often hears is – that if everyone goes organic, would there be enough food to feed everyone? This is pretty unfounded, because currently, there is a huge amount of overproduction of food, and yet everyone is not fed! Only 43% of the cereal grains grown world-wide becomes food for people; 35% becomes livestock feed, and 10% goes into making bio fuels, high-fructose corn syrup and other processed products. One-third of food produced for humans, in any case gets wasted. So the problem is not so much about quantity but usage, storage and distribution of food. If this can be rectified, then the quantity of food required itself is much lesser than what is produced currently. We’re already dancing to Dandiya tunes, and Dusshera and Diwali are around the corner. Its that time of the year, when one evening of slipping, can become a reason for letting ourselves just slip away. Lets get this straight, being ‘healthier than thou’, is a serious challenge during this time, and restricting ourselves can be quite a challenge. Hence, here are a few simple tips to stick by, which may not seem so heavy, but really work wonders to keep you close to track! Eat enough of fresh fruit and raw salads – as they help to balance out the heavy food. They also keep you hydrated and energized, also because your sleep hours may be erratic. The key is balance. A great practice would be to eat really light after a late night and heavy food. Eat fresh fruits, and sprout salad for breakfast. Let the body recover and detoxify. Drink lots of lemon infused water. Lemon is highly alkalizing. Always eat something healthy before stepping out. Have a green smoothie, a hearty vegetable soup, or a sprout salad, so that when you reach the venue, you are not starving. This way you will not end up attacking anything that comes your way. Get exercise every day, even if it is only 10 -15 minutes. It could be two rounds of the 7 minute HIIT, 11 surya namaskars, or a 15 minute jog, doesn’t matter what. This helps our circulation, boosts our metabolism, and helps release toxins through breathing and skin too. If exercize does not happen, do functional things like, take the stairs instead of lift, if you’re going somewhere close by, walk it instead of driving. None of what I am saying is anything new. We all know it, the thing then is to put it into practice. And the easiest way to start is to pick one thing. Make a habit of it, make it sing, conquer it completely, till it is not a effort to be doing it any longer. Then move to the next. And the one after. And on this note, here’s wishing you all a super fantastic festive season ahead! Any disease – be it constipation or cancer, arises from acidic environment in the body. All of us require an environment in which we can thrive. There is life on earth, because it has an environment conducive to life (as opposed to other planets where there is no life. People living in unpolluted regions undoubtedly enjoy better health or thrive than those living in polluted metros! The more polluted it gets, the sicker we get. Similarly the cells of our body also thrive in an environment, and that environment is an alkaline environment. The ph balance of all liquids in our cells as well our blood is alkaline. If this environment becomes acidic, is when disease becomes inevitable in our body. This happens in two ways. Our cells begin to function below their optimum, they degenerate, organs degenerate, our immunity becomes low and hence we end with degenerative disease. Healthy cells thrive in an alkaline environment, and cancer cells thrive in an acidic environment. In an alkaline environment, the germs and bacteria in our body remain in a balance that is just right for us. However when environment is acidic they grow, and create imbalances and this creates toxicity and conditions for illness in the body. Now what are the factors that lead to the body’s environment becoming alkaline or acidic? The main factors are – our food, water, the air and our thoughts. Every food has a ph balance, either alkaline or acidic. Water as we all know is neutral, but these days, the pollutants in the water make water acidic also, and hence we need to purify it. Air, the more oxygen it has, the more health promoting it is. And lastly, our thoughts also play a major role in our well being. We all know that our immunity goes low and we are susceptible to fall sick, when we are stressed, or under pressure. And this is because positive and happy thoughts create alkalinity, and negative thoughts create acidity. So if you want to avoid disease, say no to these 5 foods, and say yes to the top 5 alkaline foods.